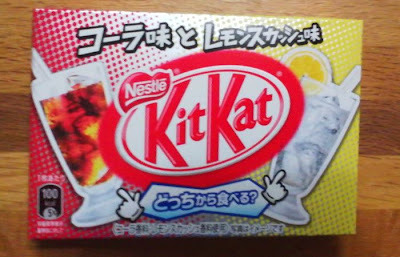 I've been on a diet, so I haven't posted any new Kit-kat posts in a while, but the latest one I just had to try: Cola and Lemon Squash! The Cola one was okay, it tasted a little fizzy with that weird cola-but-somehow-not-cola-taste you get with cola-flavored things like cola-gum and cola-pez. It was neither here nor there, delicious nor gross, fish nor fowl. The Lemon, however, was something special, it earned it's place in the Hall of Fame beside salt, green tea and sparkling strawberry. It has a mild lemon cream taste with just a tad of sour bite at the end and is a pleasing pale yellow color, just as it ought to. I'll be bringing some home in August for the curious along with aloe-yogurt and bitter almond. P.S. The text on the package says "Cola Flavor and Lemon Squash Flavor, Which will you eat first? ".